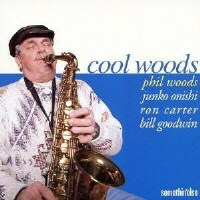 Veteran alto saxophonist Phil Woods is undoubtedly a bebop disciple of Charlie Parker, but, through his early study with Lennie Tristano and long-term stint in Europe, he developed his own sound and style that can be described as slightly "cooler" than Parker and, say, his contemporary Jackie McLean.Cool Woods is a nice album he recorded for Somethin' Else in 1999. In addition to his long-time collaborator Bill Goodwin on drums, he had two important guests to form an all-star quartet: Japanese pianist Junko Onishi and bass legend Ron Carter. The title invites a comparison with Wood's early hit album Warm Woods which, like the present album, showcased his heartwarming side with selections played mostly in medium to slow tempo. Onishi and Carter make important contributions with their individual, distinctive solos. Recorded at Right Track Studios, New York on January 4 and 5, 1999. SHM-CD uses an advanced polycarbonate material for superior sound quality and is compatible with all CD players.